Tipis are popular at Living History, Reenactments and Rendezvous. Entire camps with 100s of Tipis, are spectacular. Eye catchers at arts and crafts shows. Guest Ranches and Tipi 'Bed and Breakfasts' are favorites for a natural 'get away'. Retreat Centers create unique healing atmospheres with Tipis. Earth Science college students enjoy the mobility, simplicity, nonpolluting, and earth friendly, aspects of Tipi Living. Retired Artisans and Crafters have traded in their RV's for Tipis. Luxurious camping with vaulted ceilings and central fire places. Tipis have the original Sky Lights. 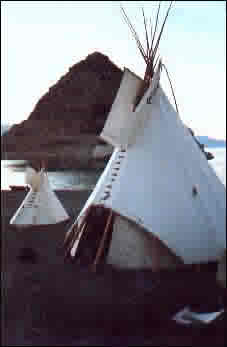 Spirit Tipis are made from exclusively Sunforger Canvas registered and patented. It is 100% Cotton, which has been treated to be: mildew resistant, water repellent and boat shrunk. Sunforger is the top of the line canvas on the market today. Spirit Tipis and liners are all made from 13oz. canvas. We offer Fire Retardant canvas as well, which some states require. The Webbing is either Polypropolene, which means the elements won't affect it, or heavy duty Cotton, which is also a great choice. A very important feature of Spirit Tipis are the lacing pin reinforcements. They are leather circles, sewn with a double stitch star pattern, onto double thicknesses of canvas. The hole for the pin is made with a punch, important because it prohibits tearing. This unique detail is strong, beautiful and adds an artistic finishing touch. A) The base of the Smoke Flaps have a custom Spirit Tipi alteration, which opens up the smoke hole and eases the stress away from the top lacing pin. 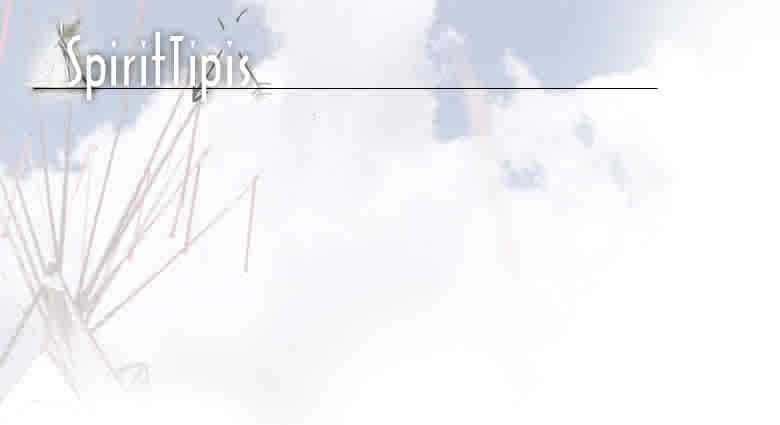 This design modification was created after much research and development. The bottom of the smoke flaps are heavily reinforced before adding the Cheyenne Extensions, which are essential for repelling rain. The Gores are reinforced with the same webbing as the flaps. B)The entire outside edge of the Smoke Flaps is reinforced with high quality webbing. Sewn around the flaps, encluding the extensions, lifting flap and pockets, insuring many extra years of wear without tearing. C)The Lifting Flap and Smoke Flap Pockets are strengthened with triple layers of canvas. The lifting flap is sewn on both sides of the Tipi to increase durability. The rope for tying your Tipi to the lifting pole goes through leather circles that are double stitched and punched out. The pockets are wide and strong to withstand the stress of winds and weather. An extra layer of canvas is sewn completely around the neck and lifting flap area. The reinforcements for the grommets are a double thickness triangle sewn into the hem. Both are then sewn again, ensuring a rip resistant tie-down. The grommets are a #4/Brass/Spur/Grommet. Strong. This is a hem using heavy duty cotton webbing for loops, which are then attached to the webbing, and then sewn around the inside of the Tipi. This is then sewn again, incorporating the extra strength of the double seam. 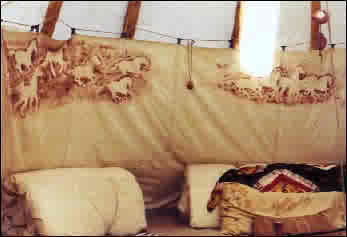 The Tipi Liner is a canvas interior wall, strung inside and snugged tight against the poles. It creates a vapor barrier and directs incoming air up the insides to conduct the smoke out. It is also there to stop ground level drafts, and diffuse shadows. The Liner comes up to approximately 5'3" inside the Tipi, with 9" on the bottom to tuck under the floor. 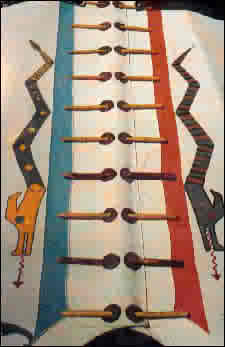 It comes in 3 pieces which tie to a rope that is strung around the insides of the Tipi poles. The liners overlap where they join, and also cross over in front of the door for closure at night or during inclement weather. The tipi door attaches with leather circles and ties, including ties on the inside for securing at night. The top of the door is anchored with the same lacing pin circles, so that the top pin goes through the door as well. There are additional ties up above the door hole, so when you are going in and out of the Tipi, the door itself can be rolled up and tied. There is a pocket on the bottom for a stick or dowel to be inserted for ease of use. There are ties on either side of the door, for those warm days when you want more ventilation. The front can be rolled up to form an arch, then tied with the custom leather ties.